The main opposition party is taking steps to discuss disciplinary action against a lawmaker and a former legislator over their remarks concerning those who lost family members in the sinking of the Sewol ferry five years ago, which killed more than 300 people. Former Rep. Cha Myung-jin wrote on Facebook on Tuesday afternoon that the bereaved families were relentlessly leeching off people’s sympathy over the deaths of their children. Both apologized after their comments drew flak from the public. 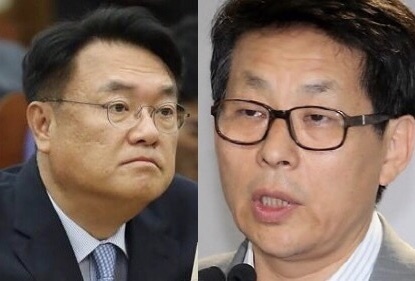 Later in the day the Liberty Korea Party referred the two to the party’s central ethics committee, which is set to hold a meeting Friday to discuss disciplinary measures against two other lawmakers who made controversial comments about the 1980 Gwangju Democratic Uprising. Meanwhile, the party’s leader Hwang Kyo-ahn apologized to the public, saying the inappropriate remarks by some within the party had been hurtful. “Even if some people might think like that, it is wrong for the party to mention it,” he said during a meeting of the party’s senior lawmakers Tuesday. In February, the Liberty Korea Party revoked the membership of a lawmaker for claiming that North Korean troops were involved in the Gwangju Uprising and that it was a riot turned into a revolt by people with political purposes. However, the party put off its decision on two others who made similar remarks -- Rep. Kim Soon-rye and Rep. Kim Jin-tae. Disciplinary measures against Cha and Chung could be discussed at Friday’s meeting. Chung has apologized, saying he wanted to convey that the Sewol disaster should no longer be a subject of political disputes and that he did not mean to hurt the bereaved families. Cha has also apologized, saying he used emotional language because he was enraged that an NGO filed a complaint against Hwang and former President Park Geun-hye as those responsible for the ferry’s sinking. Cha had written that the bereaved families received 1 billion won ($879,945) per victim and that he never heard the money was donated to prevent similar accidents. However, the amount he mentioned is incorrect. As of late last year, families of 180 victims had signed up for and received compensation from a committee under the Ministry of Oceans and Fisheries. An average of 470 million won per victim was given to the families of high school students killed in the accident, while an average of 425 million won was paid for the others. As for the 10 teachers of the high school that had sent the students on the field trip to Jeju Island, an average of 730 million won was paid per person. Some of the bereaved families chose to fight legal battles instead of signing up for government compensation. Some 355 family members of 118 victims filed damage suits against the government and Chonghaejin Marine, which operated the ferry. The court ruled in July last year that they should pay a total of 72.3 billion won to the families.